The Senate voted 51-49 Thursday night to approve its fiscal 2018 budget resolution, following a lengthy session of debate on proposed amendments. The legislation (H. Con. Res. 71) as approved by the Senate Budget Committee, sets the stage for Republican efforts to reform the federal tax code, and it orders the Senate Energy and Natural Resources Committee to slash $1 billion in spending over the next decade. But it does not recommend any cuts to federal employee benefits as part of those savings. 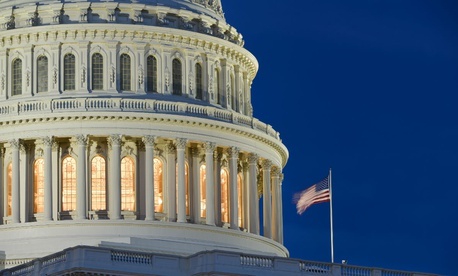 The House version of the budget plan approved earlier this month, however, calls for much steeper cuts to government spending, including a provision instructing the House Oversight and Government Reform Committee to find $32 billion in savings over the next 10 years. Sen. Rand Paul, R-Ky., offered an amendment that, among other things, would have required the Senate Homeland Security and Governmental Affairs Committee to come up with $16.9 billion over the next decade, but that measure was voted down, 4-94. Although the House budget does not specify where committee members must cut spending, a number of options have been offered by the White House and recommended by Republican lawmakers in a report accompanying the House resolution. President Trump’s fiscal 2018 budget proposal included a 6 percentage point increase in employee contributions to the Federal Employees Retirement System phased in over the next six years, elimination of the FERS subsidy for feds who retire before Social Security kicks in at age 62, and the elimination of cost of living increases for FERS retirees and a 0.5 percentage point reduction in COLAs for Civil Service Retirement System retirees. Other possible cuts could come in the form of changing the formula used to calculate pension payments from the average of the highest three years of salary to the highest five years. The House budget resolution also advocates reducing the rate of return for the Thrift Savings Plan’s G Fund, which is made up of government securities, to make it more indicative of its “low investment risk profile.” And it proposes restricting the annual increases in government contributions to Federal Employees Health Benefits Program premiums to the rate of inflation. Representatives from both chambers must now meet to iron out the differences between their resolutions before a unified version goes back to each body for a final vote. The instructions to the oversight committee on cuts will be among the differences to be resolved. This post has been updated to reflect the Senate's vote on the resolution.